Making Artistic Choices. . . Photography is the art of taking light waves, controlling their intensity, and creating a visual image. Though this process, there are several decisions or choices make regarding exposure, composition, and subject. 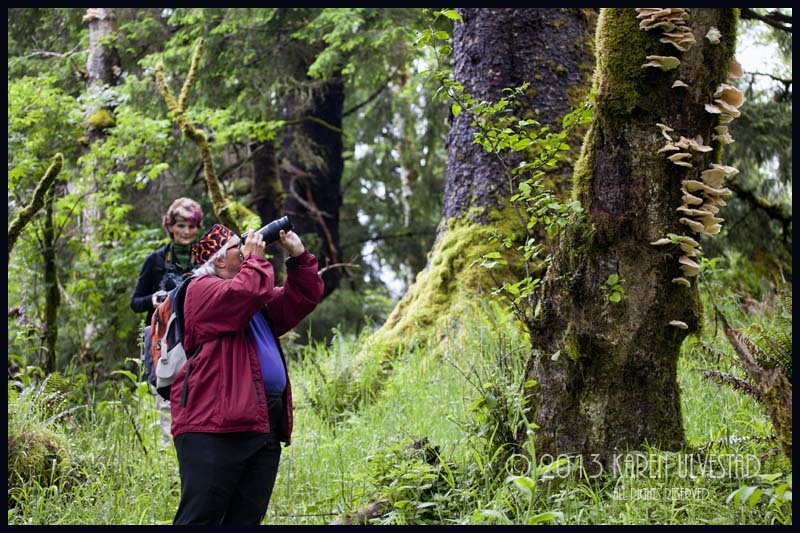 During my workshop at Sitka, we spent one day hiking through the forest. I usually spend my time working with students individually, and pointing out areas of interest. I teach by both talking and showing examples. The image below is from this workshop. We were looking for forest birds, and learning about habitat. Then, we came upon this tree, and the wonderful photographic opportunity. I pointed out the tree with all the fungus growing on its right side. It was a great subject to test out depth-of-field (aperture) and composition. The entire area covered by fungus was large. It was at least 5 feet in height, and covered the back side of the tree. The trail allowed us to walk near and partially around the tree. The image below is a portion of the whole, and the depth-of-field keeps the fungus in focus, and part of the moss. The background in a series of white circular shapes and dark greens. The white is the over-cast sky, and the green is the forest. This was shot with my 100-400 mm lens at 200 mm. 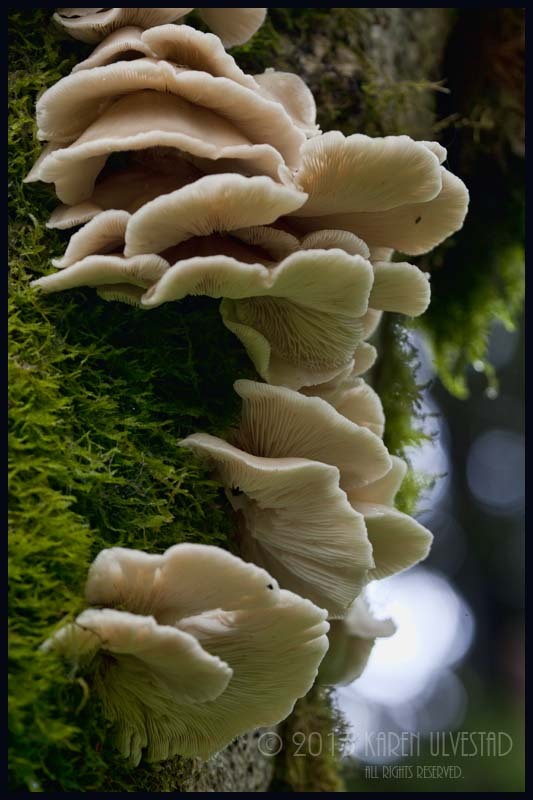 I selected a section of the fungus that showed the top and bottom textures. In the image below, I cropped tighter by shooting at 400 mm. I changed the background to the forest, which turn various shades of green. The closer crop allows the details of the subject to show in the frame. . .textures, water drops, and spider webs. I left a small section of the tree to anchor the subject in the frame. 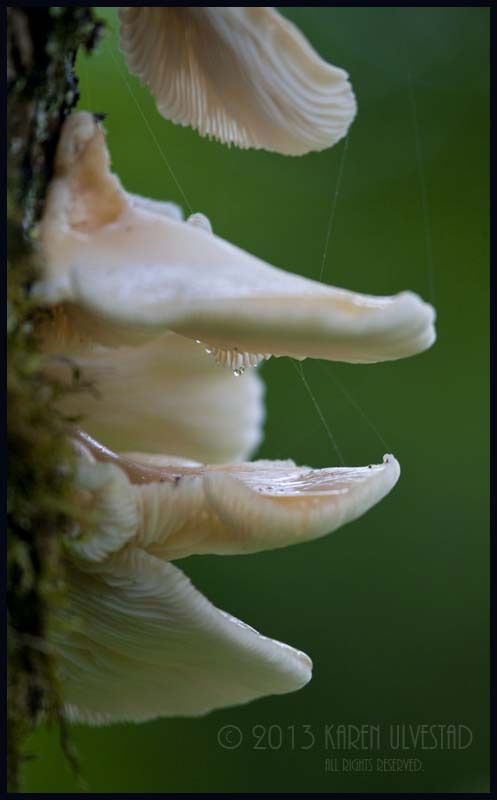 In both this image and the one above, I left space at the bottom of the frame, so the bottom fungus are complete. This gives the eye a completeness of the subject, and avoids looking incomplete. More next time. . .
My next workshop is July 27 & 28, 2013 at the Pacific Northwest Art School. Beautiful work! You are very knowledgeable re camera work. Thank you Jeanie. . .